Is this your Chihuahua mix? 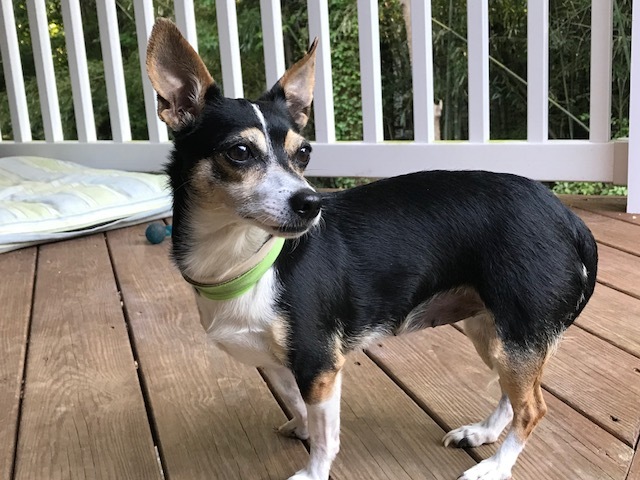 Found dog at 27th & T St at about 5:30pm on 7/26 in the Church Hill neighborhood of Richmond, VA. Tri-color adult female chihuahua. No tags, but wearing green collar with a blue jingle bell and flea collar. The dog is NOT microchipped (she was scanned immediately after being found), and she has been registered as a found dog with RACC. She is a little older, sweet, and timid. It does not appear that she was lost very long (she appears well fed & was not dehydrated). She was found standing in the middle of an empty street with no-one around so my husband scooped her up and brought her home. She’s definitely someone’s lap dog. Help us find her family! Church Hill folks, please share!